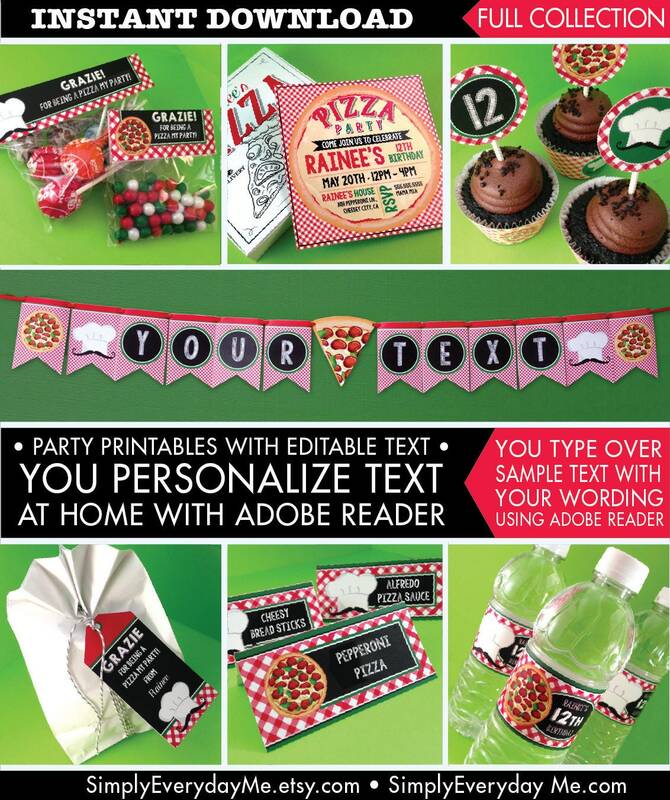 (¸.·´Personalize this Pizza Party Kit with your own text... AT HOME!!! 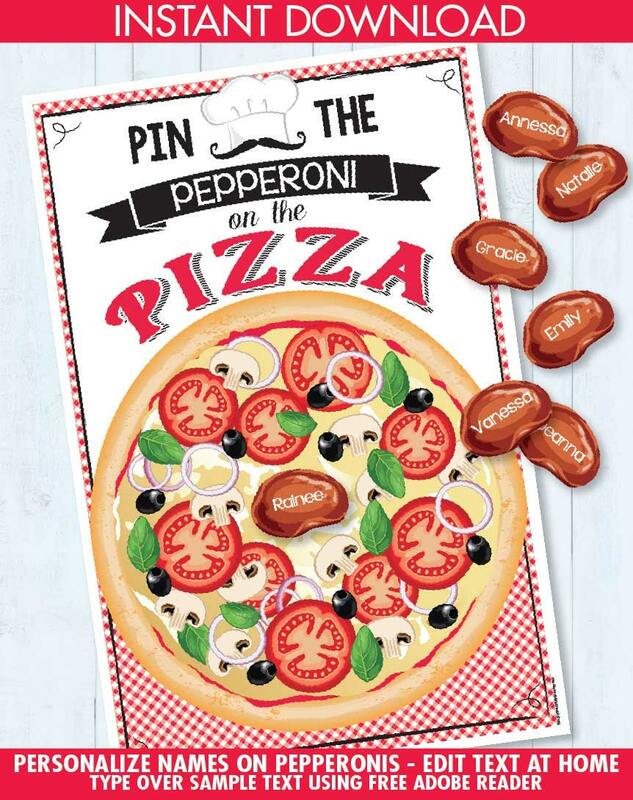 This kit is easy & fun for your Pizza Theme Party or event. This PIZZA kit includes: Editable PIZZA Invitations (2 sizes) ★ Pizza Box for a favor box or use for invitations ★ Editable Address Labels ★ Editable Straw or Cupcake Flags ★ Editable Table Tents ★ Editable Water Bottle Labels/Wrappers ★ Editable Utensil Holder ★ Editable Favor Tags ★ Thank Notes (postcards 4"x6") ★ Editable Treat Large Baggie Toppers ★ Editable Small Baggie Treat Toppers ★ Editable Candy Bar Wrappers (fits Hersheys 1.55 oz bar) ★ Editable Mini Chocolate Wrappers ★ Editable Chocolate Kiss 3/4" Circles ★ Editable Banner (print any personalized banner message you'd like) ★ Banner with Pizza Art ★ Editable 2"Circle Logos ★ Editable Cupcake Wrappers (regular size) ★ Editable Bubble/Napkin Wrappers ★ Editable 5"x7" Party Signs (Vertical & Horizontal - 2 pages) ★ Editable 8.5"x11" Party Signs (Vertical & Horizontal - 4 pages) ★ Editable Chalkboard Menu ★ Editable 11"x8.5" Pizza Game Placemats (3 different versions) ★ Crayon Box (small box for 4 crayons - 2 different designs) ★ Pin the Pepperoni On the Pizza & Pepperoni Pieces (11"x17" game & Editable Pepperoni Pieces) ★ Party Coordinating Art ★ 2 Coordinating Papers ★ Plus information for materials needed & paper suggestions ★ Plus a tutorial for editing the text with the free Adobe Reader. ★ NO physical item will be shipped! This item is an instant download digital product, so you can get your card ready to go in a jiffy! NOTE: For best results, use the latest version of the free Adobe Reader. 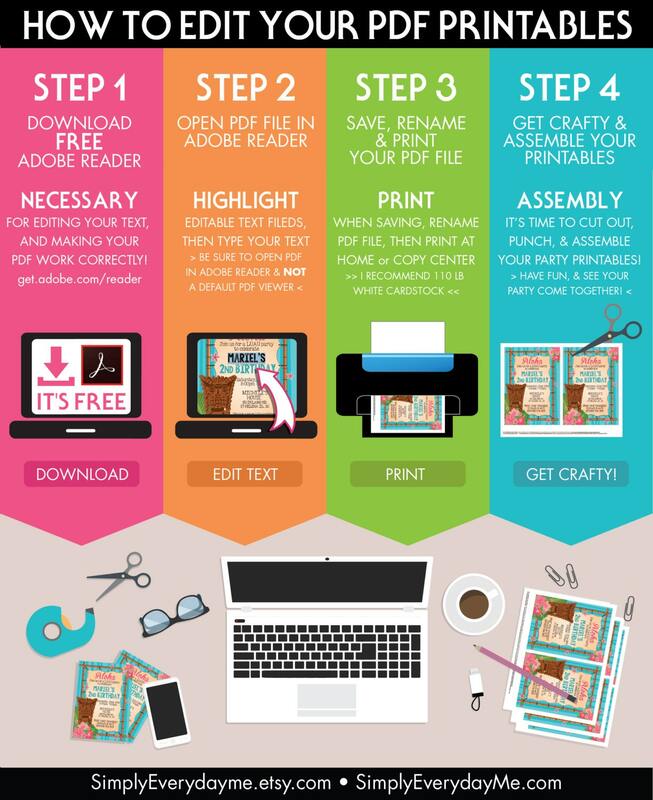 With this kit, you may print as many as you want. This PDF printable fits within an 8.5”x11” letter or A4 paper, bond paper or sticker paper is recommended. 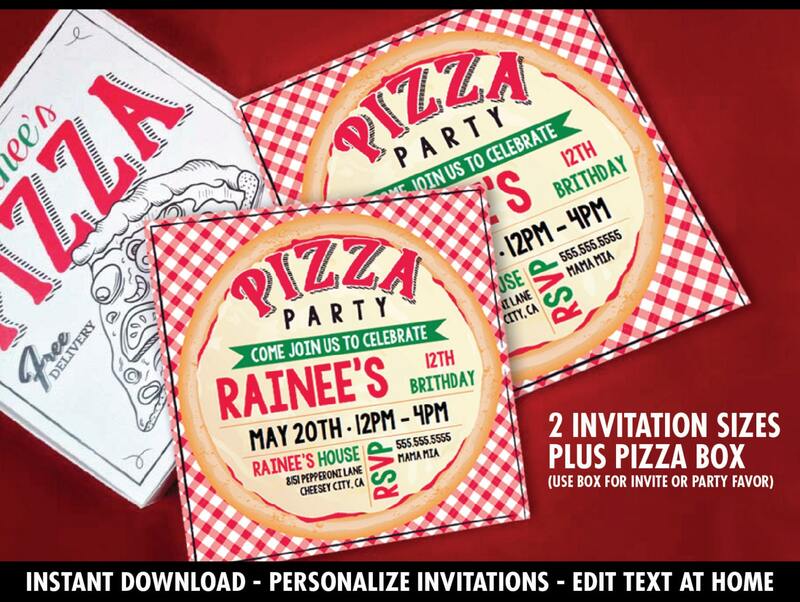 This MEGA Pizza Party Set includes EVERYTHING you need for a great personalized party... and the best part... you can personalize this kit with your own type! Just open the editable PDF file in the latest FREE version of Adobe Reader, and start typing over the sample text... IT'S THAT EASY!! Very quick turn around. I have purchased many digital downloads on Etsy and this was by far the easiest to customize. The price is excellent for what you get. I am so excited to see how everything turns out for the party.